One of the oft-repeated urban myths that sometimes pops-up in conversation even among many educated, well meaning Indians is that India as a nation is a British creation. The argument goes roughly as follows – India is an artificial entity. There are only a few periods in history when it was unified under the same political entity. It was only the British that created the idea of India as a single nation and unified it into a political state. A related assumption, in our minds, is that the developed Western countries have a comparatively far greater continuity of nationhood, and legitimacy as states, than India. This urban myth is not accidental. It was deliberately taught in the British established system of education. John Strachey, writing in `India: Its Administration and Progress’ in 1888, said “This is the first and most essential thing to remember about India – that there is not and never was an India, possessing … any sort of unity, physical, political, social or religious; no Indian nation. To teach this self-serving colonial narrative obviously suited the British policy of divide and rule. That it still inanely survives means that it is worth setting to rest. In this essay, we establish that Strachey’s colonial narrative is demonstrably false. Not only is India a coherent nation but, in fact, there are few countries on the planet that are more legitimate nation-states than India. That some of us don’t see this clearly only reflects how we have accepted the colonial myths as well as failed to study the history of the rest of the world. The concept of nation-states, i.e. that the aspirations of the people that constitute a nation are best served by a common political entity is considered a relatively recent idea in Europe from the 18th century. Nationalism led to the formation of nation-states and modern countries. This development was followed up with a gradual hardening of state boundaries with the passport and visa regime that followed it. Note that the concept of nationhood is based on the idea shared by a set of people that they constitute a nation. This idea or feeling may be based on common ties of a people based on their culture, common descent, language, religion or other such attributes. The state constitutes a group of people inhabiting a specific territory and living according to a common legal and political authority. The modern nation-state, as it exists today, is a new development for the entire world, and not just for India. Mediaeval Europe, for instance, was divided politically into many small principalities, the boundaries and sovereignties of which changed frequently. Many of the countries as we know them today got established in the 19th and 20th century, and the boundaries of these changed throughout the 20th century – in the two World Wars, border disputes and the turmoil in Eastern Europe. The United Kingdom was not really united till the act of Union in 1702 when England (including Wales) and Scotland came together. Even then they retained different laws and (even more crucially in European nationhood) retained separate national Churches. In 1801, the United Kingdom of Great Britain and Ireland was formed. In 1922, Ireland broke off as an independent country resulting in the present political formation – the United Kingdom of Great Britain and Northern Ireland. Thus the UK in its present political state, if that is the criteria to be used, is not even a hundred years old. Across the Atlantic, the picture is even more stark. In 1700, the British colonies were spread barely over the area that comprises the few North Eastern States, less than 10% of the current geographical areas. The diverse Native American tribes that inhabited the area of the present day United States could not be said to have comprised a nation, and even if they did, the current United States neither considers itself as a continuity of the native culture, nor are its people primarily descendents of the natives. Even in 1776, when America declared itself a separate state from the British, its area was a small fraction of the area it has today, mainly constituting the states on the East Coast. Only in 1845 did Texas and California, among its largest states, become part of it as a result of a war with Mexico. Washington State gained statehood in 1889, Hawaii in 1900. Thus the United States in its present political and geographic conception is barely 100 years old as a state and, at the maximum limit, as a political entity is about 250 years, with many annexations and a civil war in between. No state or kingdom existed on its boundaries before that in history. If you take Mexico, the story is better, but not much. While it has greater continuity from pre-colonial times than the United States because of the Aztec Empire that existed for about a hundred years before the Spanish Conquest, the Aztec never controlled all of present day Mexico. No other conception of nation-hood, such as shared religious beliefs, united the other areas of Mexico with the Aztec ones. Furthermore, while present day Mexicans take pride in their Aztec heritage and use symbols from the Aztec nation on their flag, they have largely lost any direct cultural continuity of either language or religious beliefs from pre-colonial times. Spanish has very nearly wiped out the native languages and 95% of Mexicans are now Christians and described as `Hispanic’. i.e. of the Spanish culture. Similarly, Africa and South America mostly constitute of state boundaries carved up by colonial rule. The present boundaries of the African states were largely carved out by treaties among the European nations between 1884 and 1899 in meetings held in Europe with no African representation into the process! While there had been some kingdoms like Ghana and Mali in earlier times that were politically united, the boundaries of current African countries rarely map to the territories of historical kingdoms. In short, if we take the legitimacy of current nation-states on the basis of centuries of common continuous political rule over the same geographical boundary and inhabited by the same people, then practically no country on the planet meets this criteria. Simply put, shifting nature of political kingdoms and their boundaries over the centuries legitimize virtually no country in its present form. To understand nationhood then as it is supports the modern nation-state, we thus must search the roots of nationhood first and foremost in the conception of nationhood, i.e. did a particular set of people, within a particular geography, imagine of themselves a common socio-cultural geographical heritage that comprised them as a nation? The first element of Indian nationhood draws from its unique geography. India is one of the few countries that can be located on a physical map of the world, even when no political boundaries are drawn. It is worth taking a deep breath and looking at the map below, reflecting on the significance of this geography before we go further. The Indian peninsula and vast plains are bounded by the ocean on three sides and the land stretches to the highest peaks of the Himalayas in the north. The vast sweep of the land ends in the East with the mountainous border with Burma. In the West, just past the Indus, the mountains come downwards towards the ocean again forming a natural boundary. Early civilizations all developed on the banks of great river systems – Egypt on the Nile, Mesopotamia on the Tigris and Euphrates, the Chinese on the Yangste Kiang. Thus civilization developed on the great river systems of the Indus and the Gangetic plain – one of the richest river-soil-climate systems in the world; and on the Narmada and Cauvery. And because of the ease of access in this land throughout the ages, there was an enormous interchange of thought and ideas, people and customs, and there developed a culture that is distinctly Indian, and at the same time incredibly diverse. The culture’s distinctive nature evolved precisely because the unique geography facilitated it. The large mountains and bodies of water separated it from surrounding cultures to give it its distinctiveness. The low barriers to movement within this land mass ensured an ease of access to build a coherent whole. This ensured that the exchanges that took place within this large separated petri dish were much deeper and longer lasting than those that took place with those from without. Hence was created a unique and diverse civilization. Among the earliest political consolidations, even by the dates of present colonial scholarship, was under the Mauryas from the 6th century BC to the 3rd century BC, when most of India was under their rule. After the Mauryas, there was repeated political consolidation of large parts of India, even when all of it was not under a single rule. The Kanishkas consolidated the north from the Hindu Kush Mountains to Bihar and south to Gujarat and Central India. The Satavahana Empire, considered to be founded by high officials of the Mauryas, consolidated the south and central parts. The Gupta Empire again politically consolidated the area from Afghanistan to Assam and south to the Narmada, possibly exerting political control even further down south. Samudragupta led an expedition all the way down to Kanchipuram in present Tamil Nadu. While the southern areas were not formally part of the Empire, they were quite likely de-facto vassal states, paying tribute to the Emperor. The only other major comparable empires in the world of this size at the time were the Chinese and the Roman. Note that it would be a thousand years after the Mauryan Empire was established and even much after the Gupta Empire that the Anglo-Saxons in the 5th century AD would first move into the region that would later be called England. It would be nearly five hundred more years before the territory of England would be consolidated as an independent political entity. Only much later would there be attempts at unity of `Great Britain’. The `United Kingdom’ that includes Scotland, Wales and Ireland, as we mentioned earlier, is only a recent political artifact. After the Gupta Empire, the Chalukya-Chola dynasty consolidated most of India in the south, leading expeditions even up to the north of the Ganges river. Later on, much of India would be consolidated again under the Mughals, and after the Mughal empire disintegrated, by the British. So while the British were the last power, before the current state of India, to administratively consolidate its territory (as well as to divide it up as they left), they were by no means the first ones to do so. Even when multiple kingdoms existed, these kingdoms were not like the countries of today with a passport and visa regime needed to cross and all kinds of regulations on movement of goods and people. A continued exchange of ideas, people, goods and scholarship took place throughout the sub-continent, largely unmindful of the boundaries of kingdoms. Furthermore, the territorial boundaries of India were largely maintained. There were few, if any, times before the British came when large parts of India were consolidated into kingdoms that were centered outside it. There were no significant long-lasting kingdoms, for instance, that ruled from Persia to the Ganges plain, or from Burma to Bengal, or from China or Tibet to Delhi. There was a separateness and integrity to this land, unlike European countries or even Europe as a whole. For centuries, the Romans consolidated north Africa and southern Europe into one contiguous centrally ruled empire, as did the Ottomans after them. Central Asia became part of one external empire or another. Even in the case of the British, when all of India became part of a larger empire centered outside it for the first time, it was clear that it was distinct from Burma, for instance, even though they were contiguous land areas ruled by the British. And thus the freedom movements in Burma and India were separate. Burma and India did not become one after their respective independence, nor was there any call by Indian or Burmese nationalists to do so. Thus there was an idea of India that made it be regarded as a separate and whole, even through political change and shifting boundaries of internal kingdoms. This then becomes our second question – is the idea of India as a unit a new idea brought by the British or did it exist long before the British came? Did the people of this vast land recognize that they were linked together? Did they share a common story of their civilization, of their Indian-ness, their Bharatiyata? Remarkably, the idea of India, as Bharatavarsha orAryavrata, appears to have been alive for thousands of years in our stories, thousands of years before there was an America or a Great Britain or a Mexico or France. From the Manusmriti, we learn of the land of Aryavrata stretching from the Himalayas and Vindhyas all the way to the eastern and western oceans. Without the idea of Bharata, there could have been no epic called the Maha-Bharata that engaged kings throughout this land of Bharata. The story of Mahabharata shows a remarkable degree of pan-Indian context and inter-relationships, from Gandhari, the wife of Drithrashtra who came from Gandhara, (spelled as Kandahar in present-day Afghanistan), Draupadi from Panchala (present day Jammu and Kashmir), all the way to Arjun meeting and marrying the Naga princess Uloopi on a visit to Manipur in the east (from where he gets the `Mani‘ or Gem). Interestingly, Arjuna is said to have gone on a pilgrimage to the holy places of the east when this happens, showing the current North-East was very much linked in this. Finally, Krishna himself is from Mathura and Vrindavana (in UP) though his kingdom itself is in Dwarka (Gujarat). Similarly, the story of Ramayana draws the north-south linkage from Ayodhya all the way down to Rameshwaram, at the tip of which is finally the land of Lanka. Note that it is not, for this particular thesis, important that the stories are historically accurate. What we are interested in rather is whether the idea of India or Bharatavarsha or Aryavrata as a culturally linked entity existed in the minds of the story-tellers and ultimately in the minds of the people to whom these stories were sacred. And these stories were then taken and told and retold in all the languages of the people of this great civilization, till the stories themselves established a linkage among us and to the sacred geography they celebrated. This sacred geography is what makes northerners flock to Tirupati and southerners to the Kumbha Mela. And the diffusion of these common ideas was certainly not only from the north to south. The great Bhakti movement started in the 6th and 7th centuries AD had its roots in the south in the Tamil and Kannada languages. Even while the boundaries of kingdoms changed, enormous cultural and religious unity continued to take place across India. It started off with the Alvars and the Nayanars (Tamil, 7th to 10th century AD), Kamban (Tamil, 11th century), Basava (Kannada, 12th century) and moved on to Chaitanya Mahaprabu (Bengali, 15th century), Ramananda (15th century, born in Allahabad of south India parentage, guru of Kabir, 15th century), Raskhan (16th century), Surdas (Braj, 16th century), Mirabia (Rajasthan, 16th century), Tulsidas (Avadhi, 16th century), Nanak (Punjabi, 16th century) and Tukaram (Marathi, 17th century), among the many. All these together weaved a garland across the land that spoke again of our common truths, our common cultural heritage. The Bhakti movement retold our ancient stories in the language of the common people, in Marathi and Bengali, in Avadhi (present day UP) and Bhojpuri (present day Bihar), in Gujarati and Punjabi and in Rajasthani. We can marvel at the cultural unity in India, where while theBhakti poets initiated the great movement for devotion to Shiva in the south, the erudite philosophy of Kashmir Shaivism was being developed coevally in the north. Or that Kamban in the south was the first poet to take the story of Rama to the major regional languages, and Tulsidas, much closer to Ayodhya, came centuries later. Or that the great Krishna bhaktaChaitanya was celebrating his devotion to the King of Dwarka in Bengal while Tukaram sang praises of Lord Vithal in the west. An immense body of pan-Indian worship revolved around the triad of Vishnu, Shiva and Shakti in their various forms – whether as Rama, Krishna, Sri Venkateshwara, Sri Dakshinamurti, Jagdamba, Durga Mata or Kali. These common stories were told and retold without the mandate of any central church and seeped through the pores of the land of Bharata, forging a shared bond, unlike any other seen on the planet. 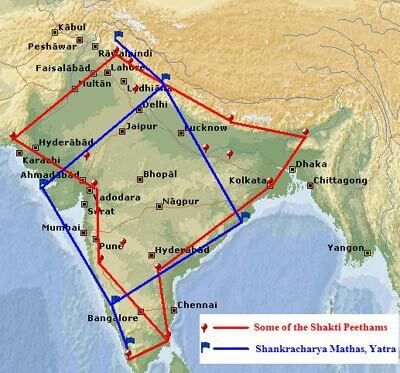 It was this idea of civilizational unity and sacred geography of India that inspired Shankaracharya to not only enunciate the mysteries of the Vedanta but to go around setting upmathas circumscribing the land of India in a large diamond shape. While sage Agasthya crossed the Vindhya and came down south, Shankracharya was born in the village of Kalady in Kerala and traveled in the opposite direction for the establishment of dharma. If this land was not linked in philosophical and cultural exchanges, and there was no notion of a unified nation, why then did Shankracharya embark on his countrywide digvijay yatra? What prompted him to establish centers spreading light for the four quadrants of this land – Dwarka in the west (in Gujarat), Puri in the east (in Orissa), Shringeri in the south (Karnataka) and Badrinath (Uttaranchal) in the north? He is then said to have gone to Srinagar (the abode of `Sri’ or the Shakti) in Kashmir, which still celebrates this in the name of Shankaracharya Hill. What better demonstration that the idea of the cultural unity of the land was alive more than a thousand years ago? And yet, these stories are not taught to us in our schools in India. We learn instead, in our colonial schools, that the British created India and gave us a link language, as if we were not talking to each other for thousands of years, traveling, telling and retelling stories before the British came. How else did these ideas travel so rapidly through the landmass of India, and how did Shankracharya circumscribe India, debating, talking and setting up institutions all within his short lifespan of 32 years? While we occupy the rarefied space of countries that have as much legitimacy and continuity as civilizations, it is worth examining a few others civilizations that have lasted. The country of Greece is one such country. However, Greece as a contemporary state was established in the 19th century, coughed up by the Ottoman Empire as it was breathing its last. Over the centuries, Greece has not existed as an independent political entity, having been absorbed by the Roman Empire and assimilated into the Byzantine and Ottoman Empires. Ironically, the rise of contemporary Greek nationalism can be traced to the late 18th century, when Greek students studying in Europe came to realize that their civilization was actually highly regarded in western Europe. This resurgent pride about the ancient Greek civilization formed the basis of the movement to establish the modern Greek state even though there was no political continuity between the two entities. If the continuity of political unification is the criteria that is used to define the legitimacy of a country, then Greece is far less legitimate than India, and other countries around the globe are even less so. The boundaries of the contemporary Greek state do not match with the original Greek Empire. Furthermore, even ancient Greece constituted of politically independent city-states, united more by the feeling that they belonged to the same culture, rather than having political unity. So clearly the measure of political unification, even when it did hold true for large parts of India over the ages, is not the relevant criteria, but the idea of a shared culture and civilization. The only other continuous civilizations that come close to India as legitimate nations are nation-civilizations like Egypt, Iran and China. But Egypt, though old, having been assimilated in various empires and conquered first by Christianity and then by Islam, hardly retains much contact with its ancient traditions, languages or indigenous religion. Similarly Iran, the inheritor of the Persian empire which reached its peak in the 6th century BC, was assimilated into other empires and finally conquered by Islamic Arabs – it retains little of its Zoroastrian roots, though it retains its pre-Islamic language, albeit in Arab script. China is the other civilizational nation that can claim to have a legitimacy and continuity similar to India. However, for most of its history, Chinese civilization developed and concentrated in the Eastern plains. Consolidated rule, either political, social or religious/ideological over the entire vast area that present-day China occupies is relatively recent. Indian Buddhism obviously had a huge influence on China. Interestingly, despite communism and the Cultural Revolution, Chinese intellectuals have sought to link the roots of present day communist ideology with the teachings of Confucius. So there we have it. India is one of the few nations of the world with a continuity of civilization and an ancient conception of nationhood. In its religious, civilizational, cultural and linguistic continuity, it truly stands alone. This continuity was fostered by its unique geography and its resilient religious traditions. Unlike any other country on the planet, it retained these traditions despite both Islamic and Christian conquest, when most countries lost theirs and were completely converted when losing to even one of these crusading systems. The Persians fell, the civilizations of Mesopotamia and Babylon were lost, the Celtic religion largely vanished, and the mighty Aztecs were vanquished, destroyed and completely Christianized. Yet Bharata stands. It stands in our stories, our languages, our pluralism and our unity. And as long as we remember these stories, keep our languages and worship the sacred land of our ancestors, Bharata will stand. It is only if we forget these truths that Bharata will cease to be. That is precisely why the British tried to hard to make us forget them. Indian scholarly traditions often presented opposing viewpoints with the thesis. Here are some objections that may arise. What you are calling the Indian civilization is actually the Sanskritic civilization of the Aryans who were invaders. There are many theories about migrations of people into the Indian sub-continent. Some contend that a tribe of people called the Aryans migrated from somewhere in the Middle East or Central Asia. Others contend that no such migration took place and the Aryans were original inhabitants of the Sindhu (or Sindhu-Sarswati) region. Still others hold that `Aryan’ was never an ethnic term but the word `Arya’ in Sanskrit basically means a noble person. In any case, practically all countries that exist today were settled by migrants. The Saxons, the Franks and the Visigoths were all migrants to western European countries such as present day England, France and Spain. North America was recently settled (or more accurately, usurped) by migrants. Even the Native Americans in North and South America are considered to have migrated from Asia 30,000 years ago. At some point in history, it may be that all people came from Africa. Clearly, using this criterion, all nations of today are illegitimate. So the validity or lack thereof of a particular Aryan migration theory, even assuming such a migration ever actually took place, does not concern us. Suffice to say, that even those that subscribe to the theory of an invasion or migration place the date no later than 1500 BC. By contrast, the Saxon reached present-day England in only the 5th or 6th century AD, about 2000 years after the hypothetical Aryan migration — yet England is considered an Anglo-Saxon country and no one wastes a whole lot of energy arguing otherwise or creating political factions representing the `pre-Saxon’ people. That a hypothetical Aryan invasion 3500 years ago is still relevant to our politics shows the absurd divisions created in our minds by colonial theories, intended to keep us fighting amongst ourselves on artificial boundaries. So, regardless of whether there were such a people as Aryans or whether they came from the outside, our interest is in the fact that the people who have inhabited India over the last 3000 or more years formed both a conception of Indian nationhood and a distinct civilizational continuity. Our hymns sing glories of the Himalayas, not of the Caucuses. Our stories talk of the Vindhyachal not a mountain in the Central Asia. We sing of the Ganga and the Cauvery, not the Amu Darya. Thus for thousands of years the people who have lived in India have celebrated its sacred geography. Regardless of their origins in pre-history, our ancestral people made the land of India their home and wove stories around its features. Isn’t India simply like all of Europe, sharing some common history and religious ideas but no more? Parts of Europe came under the rule of the Roman Empire and later the Byzantine and Ottoman Empires. None of these Empires held sway over all of what is the territory of Europe today. Rather, their areas of control were largely around the Mediterranean Sea – parts of southern Europe, northern Africa and the Middle East. There has also been some uniformity of religion in Europe imposed by the Roman Catholic Church and the Eastern Orthodox Church. But, there has been no empire of Europe. Eastern, western and Scandinavian Europe have had substantially different histories and cultural, linguistic and ethnic origins. There is a more significant difference. The land of India has been thought of and considered a sacred whole by the people of India in a way that is simply not true of Europe. As the Shankracharya of Kanchi said recently, for thousands of years, Indians throughout the land have woken up in the morning and sang a hymn celebrating the holy rivers of Ganga, Yamuna, Narmada, Godavari, Sindu, Saraswati and Cauvery as part of nitya kriya, or daily worship. Thus our hymns and religious stories not only share common themes, heroes and deities, they also uniquely link us to this particular land in a way Christian stories do not link to the land of Europe. There are no hymns that Europeans sang that spoke of the land from the Urals to Scandinavia or from the Arctic Ocean to the Mediterranean as one. No one sang devotional songs listing all the major rivers of Europe, east to west. The idea of Europe is like another continent, like Africa or Americas – with some shared geography and history but no historic conception of the integrated whole as a unity that was recognized among all the common people. Thus there have been no religious stories of Europe linked to its particular boundaries and capturing the common fealty of the people, unlike the story of Shakti being dispersed over the land of India in peethams that millions of people visit, or the sage who set up mathas in the four quadrants of the land, or who wrote the Mahabharata, or who wrote of the land of Bharatvarshaand Aryavrata. So there is a unity to India, an Indian nationhood that is far greater than any shared similarities between Europe. If the British hadn’t been here, wouldn’t we be a bunch of fighting kingdoms? The British certainly contributed to the political re-unification of the land, just as the Mughals had done before that. But they re-unified politically an existing civilization entity. This entity had existed long before they came, had been politically re-united in the past and will exist long after they have gone. The British experience is part of who we are today, so they certainly added to our civilization. But the British also divided and partitioned us, not only physically but also mentally. They also impoverished us and planted many seeds of divisive scholarship that cut us from our roots and our sense of nationhood. There are many entities today who would see us become a bunch of fighting states, all the easier for political, religious and economic conquest. But a division of India is like cutting a human body. We are already bleeding from the cuts inflicted 50 years ago. Eternal vigilance is the price of our freedom. Telling our common stories, the core of our nationhood. Some Indian Muslims are descendents of Persian, Turks and others. Many more are descendents of people who have been in India for thousands of years. In the Indian Muslim caste system, the invaders were considered higher castes than the natives and tracing one’s `foreign’ status often yielded greater prestige, leading more people to identify themselves thus. As late as the early 20th century, some Indian Muslims continued to identify themselves as `Hindu Mussalmans’ (as they might have been called) to census takers marking the civilizational, rather than religious (in a separative sense) meaning of the term Hindu. In either case, it is somewhat irrelevant. Even the Persians and Turks who settled here in numbers came here far before America, for instance, existed as a country. The Indian civilization has assimilated many people into its bosom and there is no reason that the descendents of the Persians or Turks who migrated to India can be considered any less Indian as result. You say that Islam is not the basis of nationhood, yet Pakistan is founded on the very premise. 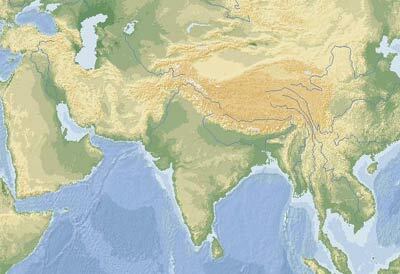 Your geographical conception of India includes present-day Pakistan and Bangladesh. Do you want to create an ‘Akhand Bharat’ and re-unite India by force? Pakistan is an entity with no civilization basis. In an attempt to create one, Pakistani history textbooks teach that Pakistan was established by Babur as `Mughlistan'. However, Babur was a Turk of Mongol descent and the majority of people that live in Pakistan today are certainly not descendents of Turks or Mongols nor is their civilisation Turkic. Pakistan’s crisis of identity emerges primarily from the rejection of their ancient civilizational roots in the name of `religion’. Till they can reconcile to their roots, they will remain a rootless nation, preserved per force by the state apparatus as long as it lasts. The idea of Bharata certainly goes from Kashmir to Kanyakumari and from Sindh to Manipur. However, the idea of re-uniting Pakistan or Bangladesh to India is unviable at this point in history. The best one can hope for is that the people of Pakistan and Bangladesh themselves become aware at some point of their deep civilization roots that have been taken away from them in the name of religion. India is not a `Hindu rashtra‘, you are trying to make India into a Hindu rashtra. The interest of this essay is in establishing what is true, not in any political flavor of the day. In the multi-century big picture, particular political movements or systems of government will come and go, but the history of our civilizational roots still needs to be understood and articulated. Our reading of history certainly does not support Hindu rashtra as a religious concept that means it is only for those people who are currently called `Hindus’ as a religious term. Classically, Hindu has been a civilizational, not a religious term, nor is it exclusive. `Hinduism’ is different from Abrahmic religion in this regard. Has Encarta been saffronized? Or is it merely stating the obvious, albeit in a westernized framework? That there is no India without what has been called `Hinduism’. This by no mean implies that all the people have to `convert to a religion’ called Hinduism to be Indians. It also doesn’t imply that those who worship Allah or Christ as a religious idea are inherently lesser citizens or disloyal. Rather, it is simply recognition of the civilizational heritage that links us together as a nation. In contemporary times, the civilizational term Hindu has been replaced by the term Indians. The roots of the Indian civilization, when the concept of the land of Bharata or Aryavrata was articulated and absorbed by the people of this land, are thousands of years old. Even though much of what constitutes these roots is now classified as `Hinduism’, which is unfortunate and limiting, the wide diversity of our civilizational beliefs and quest for knowledge and understanding cannot be confined to a religious dogma or belief system — it belongs to all Indians. Furthermore, pluralism is a basic principle of Hindu thought, which leaves plenty of room for other beliefs in the framework of mutual respect – as long as these beliefs are not directed at destroying the roots of the very civilization that holds them. Certainly, those that are called `Jains’ today have stories that refer to Krishna, the `Sikh’ Guru Granth Sahib has hundreds of mentions of `Rama’ and many Muslims are quite happy to acknowledge their roots in the Indian civilization. Hundreds of Indian Muslim poets have celebrated their civilizational roots – Abdul Rahim Khan-e-khan wrote poems in praise of Rama, in Sanskrit; Justice Ismail of Chennai was the leading authority on Kamban Ramayana; Kazi Nazrul Islam wrote powerful revolutionary poetry in Bengali replete with references to Kali. In recent times, the script for the entire Mahabharta epic was written by Masoom Raza Rahi; and who can ignore the inspiration that our Gita-reading president Abdul Kalam from Rameswaram is providing to the nation. All these people have had no trouble in reconciling their reverence to Allah or Jesus without denying the civilizational heritage that binds us together. The converse of this is also true – that the way to break us apart is to systematically deny and denigrate our civilizational roots. This is exactly the tactic the British used. Thus the evangelical Baptists preaching in the North East have over the last few decades told the Nagas that they don’t really belong with the Indian civilization – despite the fact that they have a place in our stories as far back as the Mahabharata, when Arjun goes on a pilgrimage to the holy places of the east and marries the Naga princess Uloopi. Similarly do Manipur, Tripura, Meghalaya, Assam and the other states in the North East. The situation in Kashmir, spurred on by Pakistan, is a surviving artifact of the two-nation theory even while Kashmir has always been a significant part of the Indian story, its religion and philosophy. The Khalistani separatist movement is also the outcome of decades of colonial scholarship that continues till today to prove that Sikhs are completely different from the `caste-ridden’ Hindus and emphasizes the separateness rather than the common roots. While the Khalsa panth was clearly established as a separate path, the teachings of Guru Nanak can be placed very precisely in the Bhakti tradition while keeping to the idea of a Nirguna Brahma.Guru Granth Sahib is liberally saturated in the philosophical and religious streams of Indiandharma, yet contemporary scholars continuing the colonial tradition often fail to educate people about this. The root of all movements to break India are ultimately found in denying the religious and cultural unity of the Indian people – whether it be found in movements inspired by colonial scholarship, communism, pan-Islamism or evangelical Christianity. I am not religious, but am a patriotic secular Indian. Why is all this relevant today? I am uncomfortable with the idea of religion defining our nation – we are a secular country. The idea of being `religious’ is ultimately a western idea. In the Indian tradition, there were atheistic and materialistic schools of thought, like Charvaka, all of which get lumped under `Hinduism’. Obviously, if we take the Abrahmic idea of religion, atheistic religion is absurd – you can’t really be a ‘Christian atheist’ or a `Muslim atheist’ – not so long ago you would be hung for heresy. Hinduism is a colonial term for the rich banquet of the dharmic traditions that cannot be combined under the framework of religion. Indian civilization is a much broader concept than narrow restrictive dogmas that define religions. A secular state is a system of government. We have embraced secularism precisely because of our long civilizational history of accepting plurality of thought and worship. This is how it must remain. However, secularism does not define nationhood in any way. There are plenty of secular states. What is unique about us is that we are Indians with a history of civilization rooted in our religious and cultural ideas. That is why we are a nation today, not because of secularism. If false notions of secularism prevent us from understanding the roots of our nationhood, we will all be the lesser for it. But to get back to the question, nations are born, but are also made. If we fail to understand our common civilization, we will ultimately fall prey to those that seek to destroy us – by convincing us that we have none, that India is a British construction and so on. The effect of this will not only be a separation from the Indian state, but from the Indian tradition. To see the devastating effects of this, consider that we are still paying the price of our first partition based on accepting colonial ideas and still struggling with its wounds. If India gets split up into different countries, we will all lose – there will be more wars, more armies, and all the lines we draw will be artificial and straight across our hearts. Every child in America in a public school recites an oath of allegiance every morning in front of the American flag. They obviously take their nationhood seriously, even as they are a young nation. While we are old as a civilization, we are young as a country. Our education is based on colonial scholarship. Nationhood is ultimately a feeling of being one people. To strengthen this feeling and being resilient to divisive propaganda, we need to see that every child in India is educated about why we are a nation, lest we forget why we are together. © Sankrant Sanu 2002-2010. All rights reserved. Your views are ok for those who read and write but what about the illiterate mass who have contributed their might for building this nation? Brilliant masterpiece. ….hats off to the research n in depth study that moulded this essay. It couldn’t have been any better. This study should not go a waste and must be circulated through our curriculum. The younger generation needs to know of our country as Bharathvarsh. What about Maha Janapakas ? Were they not different nation states ? What about all the republics that were consolidated by PATEL ? Alex Harris Ridiculous, hatefull, and creating fabricated enmity between communities when no such division or so-called "Aryan" race actually exist, proven by science. There is no race called "Aryan" as propagated by Germans and Britishers for their vested interests and to divide and rule India. "Arya" is a Sanskrit term meaning "Noble". Ram was called, even so called Dravidian King Raavan was called " Arya Putra" The fact is there is nothing like Aryans supported either by archaeological evidences, genetics/DNA sxience or our literature(Vedas, Tamil literature). So stop believing in this fiction propagated by Marxists and Britishers to divide north and south India to be able to rule minds of people and rule India directly or through proxies. All the recent research prove otherwise all Indian living in India are natives and not foreign. We have been living here for than 10,000 years. Alex Harris So-called "Aryan" race doesn't actually exist, proven by science. There is no race called "Aryan" as propagated by Germans and Britishers for their vested interests and to divide and rule India. Are you a fool. Vaishnavism and Saivism are older than your cult of Christianity. If at all there is possibility of influence, then it is Christianity which got influenced by Hinduism. Dharma(which is now popularly known as Hinduism) is older than 10000 years. Christian chronology which can't think beyond 60000 years is pony in front of Dharma. When there was no Bible, no Juadism nor the word Yahweh, Jesus there existed Vedas. The Vedas has been in existence for more than 10000 years orally and 5000-6000 years in documented/written form. So take your Christian propaganda somewhere else. Fact is even to convince Hindus to convert you have to use deceit, false story, and help of Hinduism. This shows hollowness of Christianity. Wow, this is brilliant stuff. Thanks for writing it. I hope it shuts up the JNU / Leftist / Romilla Thapar nonsensical versions of Indian history. Good to see an article of this nature.A minor error it is Kamba Ramayanam in fact. i am a not a little puzzled that there is no reference to the wonderful book of Prof Radhakumud Mookerji called The Fundamental Unity of India published in 1914 which covers the subject succintly. Reprints are still available and inexpensive too. Please read the following news article. It says about Arjun marrying a Manipuri Princess as false and there is no evidence for the same. Please let me know if you have any proof of the thing you have claimed. Otherwise I cannot trust the article above.